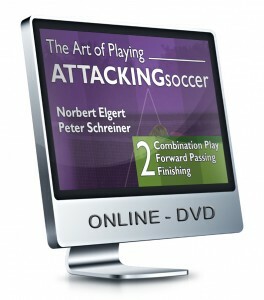 In the soccer drills Y-Drill players practice fast passing sequences in tight spaces. Frequent repetition makes for effective training in a relatively short amount of time. 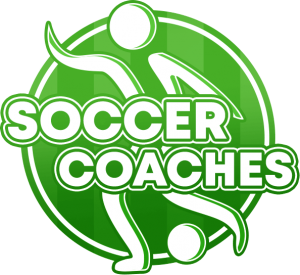 Players should practice on both sides, so that they use both feet. 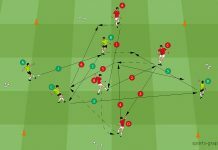 In the basic exercise, five players practice the passing lanes and running paths in the Y formation, mastering these before moving on to the variations. 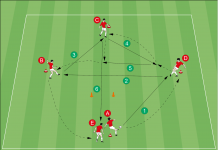 Each player runs to the next position (A to B, B to C and C back to the starting position). The exercise then continues on the left side with Player D.
2 B passes back to A, then actively attacks him. 3 A passes to C, who has gotten away from B, and shows for the rebound. 4 C passes into A’s path and runs back to his cone. 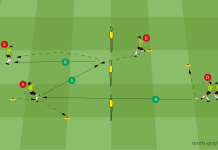 5 A passes into D’s path (toward the goal) and takes D’s position. 6 D sprints to the ball and shoots.